These characters are from "Mobian RPG"
Cemator: One bad, undead hedgehog! Dadaeleon: Renegade Evra, Strike Team member, & owner of the Metal Cyber Emerald. Dadaeleon, again: Revised look for the Evra renegade. 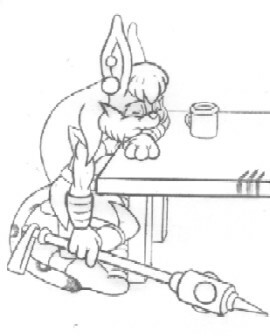 Kalindra Raistani:(b&w) A rabbit/magic-user I played in Duo's "Mobian RPG". 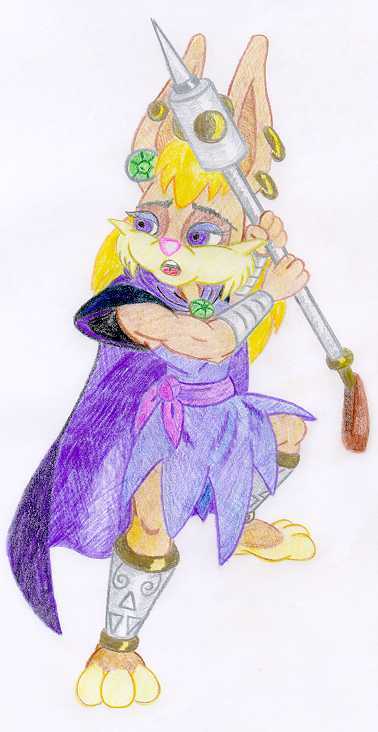 Kalindra3: An old drawing that I used to use on Kal's profile page. Kalindra, walking: My most current rendition of my battlemage. Fun with color pencil: Just wondered if she'd look good in c.p. Kalindra, armored: Kalindra -finally- figured out how to activate her Spectral Emerald's armor. Kalgoyle: "Note to self: never eat Red Goop(tm) Cookies..."
Kalindra--Profile Page. : Bio-sheet for this character. Kalindra, as a baby: One of Centurion's 'baby pics' inspired this. Mobian Saiyans?? : This is proof that I've been watching too much Dragonball Z. -What- action? :Mobian RPG has been inactive for months. This is what Kalindra thinks about it. These characters aren't associated with any particular RPG, messageboard, etc. 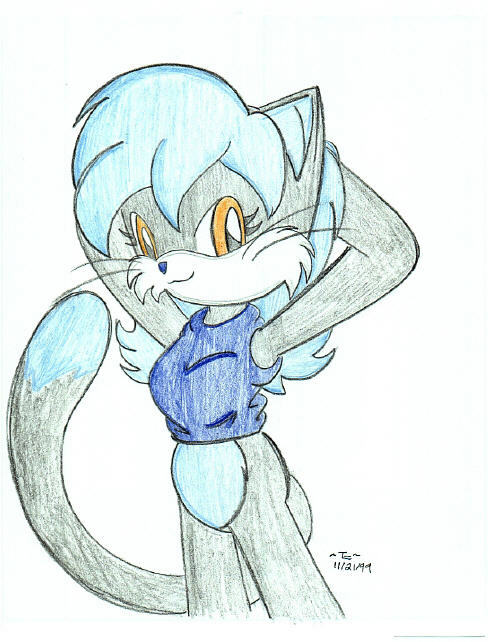 Kat MoKat: My oldest Mobian persona, used mostly in play-acting--and MessageBoard fics! Armored MoKat: Let the mischeif begin! SquirTony: This is what you'd get if ya combined a Squirtle with Tony the Hedgehog. JenVee?!? : Jen, as an Eevee. Hey, weird stuff happens in MB fics! Clanker: My Dark Legion scientist. Cor Echidna: My Dark Legion demolitions expert. Foxy Guy: Inspired by one of my "doodles". I still dun have a name for this guy--but I think he looks cool. Sailor SprayPaint: Whenever Sailorness/Pretty Sailor Soldier Sickness hits the Mobius Forum, I become Sailor Spraypaint..
Hatless again?? : What my Dark Magician normally looks like...er, but without his hat. Chibified: Ack! Gotenks the Hedgehog hit us with a Chibi Pillow during the Pillow Fight thread at the S.P.A.! !